Summer is actually a time of having things cool and refreshment all the time. It is a pleasant time period of the year at some extent, but on the other hand some people greatly suffer the summer season as a big nightmare due to having prickly heat or you can know it as heat rash or sweat rash. The medical term of prickly heat is miliaria. 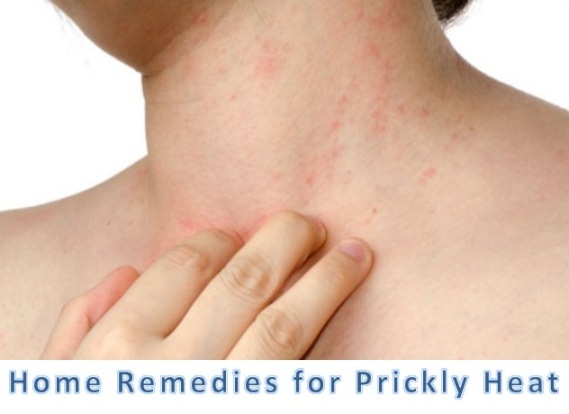 Prickly heat commonly appears on the skin and is happened to the children, adults and even new born babies. People who live in hot and humid climates are the victims of this problem. Those people go through the excessive sweating and thus the sweat glands are blocked. Gradually, it irritates the skin and then result in prickly heat. Some other conditions of having prickly heat are bacterial infections and underdeveloped sweat glands. Prickly heat can appear anywhere on the body, but it usually affects the feet, back, neck, mole, armpits, abdomen, hands and upper chest. The common and usual symptoms of prickly heat are stinging sensations, mild inflammation, and small red round bumps or rashes that itch. Basically, prickly heat settled down naturally as the summer seasons gets improve. For this condition, the first thing you should do is cool down your body; you should stay in an air-conditioned room, take a bath or shower so as to minimize the sensations of prickly heat on your skin. You can also try some effective home remedies and they do not have side effects so it cannot be harmful for you. Oatmeal is very popular for treating the prickly heat because it contains anti-inflammatory and soothing properties. If you apply oatmeal on the heat rash then it will give you an instant relief from that. Take some oatmeal and finely ground it. Now add the powder to a bathtub filled with cold water. Stir it well until the water becomes like a milky color. Now dry your body using a soft towel. Do this remedy twice for a week. Use a cold compress over the affected area because it gives you an immediate relief from inflammation and itching sensations. Take some ice cubes and wrap them in a dishcloth. Now place the cloth on the affected areas for about 10 minutes at a time. Repeat the process every six hours for about three days. Another remedy you can use is soak a cotton cloth in cold water. Strain the excess water then place it over the affected area for 10 minutes. Repeat the remedy four times a day for about a week. Sandalwood has soothing properties that quickly helps in diminishing the symptoms of prickly heat. It can help in making your body cool due to which you can recover as fast as possible. Take equal amounts of sandalwood powder and rose water in a small bowl. Apply this paste directly on the affected parts of your skin then leave it for some time to make it dry. Follow this remedy twice daily for a week. Similarly, another thing you can do is take two tbsp. of each sandalwood powder and coriander powder with adequate amount of rose water and make a smooth paste. Slur this paste on the targeted parts of your skin then leave it to dry. Wash it off with cold water then pat dry your skin with the help of soft towel. Repeat the remedy twice daily for a week. You can also pour the sandalwood powder in any empty bottle of powder and use it as talcum by sprinkling over the affected areas. Baking soda is also very powerful towards getting rid of prickly heat. Baking soda works as exfoliating agent that help in unclog pores by removing the dead cells, dirt and impurities. Take a cup of cold water and add one tsp of baking soda in it. Take a clean washcloth and soak it in the solution. Drain out the excess of water from the washcloth. Put the washcloth over the affected area for 10 minutes. Repeat the remedy four to five times a day for a week. Fuller’s earth is commonly known as multani matti, everybody is familiar with multani matti. It is a popular remedy for treating the prickly heat. It helps in getting rid of inflammation and itching. Take five tbsp. of fuller’s earth in a small bowl and add three tbsp. of rose water. Now mix them together to make a thick paste. Allow it to dry then wash it off with cold water. Follow this remedy once daily for a week. Margosa is commonly known as neem which contains anti-inflammatory function and antiseptic properties. It works as the control symptoms of prickly heat from itching and inflammation. Grind a handful of fresh neem leaves into a paste. Apply this paste on the targeted areas of the skin. Now allow it to dry completely then rinse it off with cool water. Alternatively, You can also boil the neem leaves in two cups of water for about 20 minutes. Strain the excess amount of water then allow the water to become cool down completely. Soak a cotton cloth in the solution and place it over the affected parts for 10 minutes. Follow this remedy four times a day approximately for a week. Another tip that you can use is take some crushed neem leaves and mix them with half a cup of gram flour and a little amount of water. Now it will come in the form of a paste. Apply this paste on the affected area then leave it for 15 minutes then rinse it off with cool water. Use this remedy daily for a week. Aloe vera is an amazing and popular soothing agent which contains anti-inflammatory and cooling properties. It is an excellent remedy for heat or swear rash. Rub the gel over the affected parts. Leave it on the skin for about 20 minutes and then take a cool shower. Do this remedy for at least two times a day for about a week. Gram flour has a quality of absorbing extra moistures from the body which in turn helps in reducing the prickly heat. It is also used to remove the dead skin cells and open the clogged pores. Take two tbsp. of gram flour and add a little amount of water in it to make a smooth paste. Apply this paste directly on the targeted areas. Leave it on your skin for 15 minutes and then rinse it off with cold water. Follow this remedy once daily for about a week. Raw mangoes are very cool in nature so that useful for reducing the heat sensation from your body. Raw mangoes make you get relief from itching and other symptoms of prickly heat. Take two raw mangoes and wash it thoroughly then put it under the two cups of water then boil until they become soft and tender. When become cool, remove the mangoes from the water then squeeze the pulp from inside them. Add the pulp into the cooled water with the rock salt and sugar according to your taste. Drink that solution for two times a day to speed up the healing process. Cucumber also has an excellent cooling effect that helps in soothing and relaxing the whole affected skin from the prickly heat. Take a cucumber and cut into thin slices. Soak them for few minutes in a bowl of cold water. Now add two tbsp. of lemon juice in it. Place the soaked cucumber slices on the areas for 10 minutes where heat rash are appeared. Do this remedy three times daily for a week. You can also rub cucumber pulp by squeezing from it. Apply this directly on the affected area then leave it for 30 minutes then wash it off with cold water. This will help you in cooling the body and make it hydrated. Do not wear tight clothes while in hot season as it tends to irritate the skin. Find the cool place at your home to sleep. Try to avoid the oiling and creams that it will block the skin pores. Drink higher amount of water during the summer season. Try to keep yourself under the shaded areas while outside. Take cool shower two or three times a day. Avoid exposure to sun in excessive heat and humidity whenever it is possible. I do not think I have ever experienced this. I hope the home remedies work. Thanks for your comment, yes these remedies will work for prickly heat and sweat rashes.